With a city where there is just so much to see, how do you narrow it down? 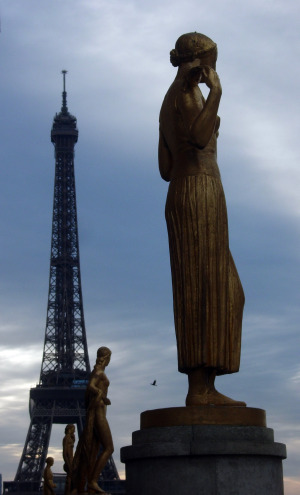 Here is our personal list of the top 10 Paris tourist attractions. Along with each attraction we list "other things to see in the area" as this helps tie it all together and makes the visit more personal. We give you a quick list of Paris attractions but you're also going to need a good guide book to really make the most of these areas. We've tried out several while living in Paris. For a list of our favorite Paris guide books, click here. You don't have to love it, but you do need to see it! It never matters how many visitors we take the first reaction is always the same "Wow"! For the best "wow" approach we suggest starting from Trocadero on the plaza by the Palais de Chaillot (metro Trocadero) or approaching from École Militaire through the Champs de Mars (metro Ecole Militaire). For tickets be prepared to wait in line for at least one hour and possibly two. Soon you'll be able to pre-buy tickets from the official Eiffel Tower website - unfortunately this service is not available yet. If you're looking for a new way to see Paris then try the Fat Tire Bike Tour or the Segway Tour both of which start under the Eiffel Tower. Snack bars on and around the Eiffel Tower are not great and tend to be expensive. Instead try the famous Paris tea room "Carette" at 4 Place de la Trocadero and enjoy their famous hot chocolate, excellent patisseries, homemade ice-cream or a light lunch. It doesn't matter how many times I come here or at what time of day, this square is just so impressive. The gold topped obelisk, the fountains, the fact that you are surrounded by Paris landmarks, the exceptional views up the Champs Elysees and down through the Tuileries Gardens to the Louvre. 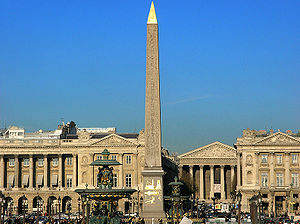 If you have only one day in Paris then this square should definitely be on your must see list of attractions. Place de la Madeleine - with famous church, flower market and high end food shops including Fauchon, Hediard and the Boutique of Maille (mustard). 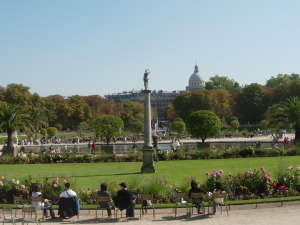 French gardens covering 68 acres that connect the Place de la Concorde with the Louvre. The gardens were laid out by Andre Le Notre the same landscape designer that designed the Versailles Gardens. 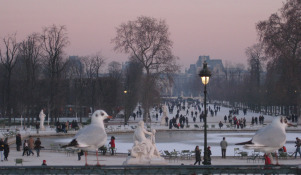 Stroll the sandy gravel paths, admire the many statues or pull up a seat and enjoy some of Paris's best people watching. For children there is plenty to enjoy including pony rides, playgrounds and even a special trampoline play area. 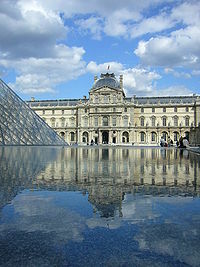 Museums in the gardens include two of my favorites the "Musee de l'Orangerie" which houses Claude Monet's paintings Les Nymphéasand the Jeu de Paume which is a photography museum. Place Vandome - home of famous Ritz hotel and high end jewelery shops including Cartier. The sheer size and scale of the Palais du Louvre are simply breathtaking. I love to just walk through the main courtyard and admire the glass pyramid, the still waters and the buildings that date back to the 12th century. The museum itself is incredible but can be overwhelming. Just pick out a few things to see and leave yourself enough time to enjoy the details and beauty of the building itself. If you're visiting with children that shudder at the very mention of the word "museum" then try a scavenger hunt to find some of histories most famous works of art... this helps make the visit more exciting! If you need a break before or after the museum skip the boring food court and head to the elegant Cafe Marly located in the Richelieu wing in front of the Pyramid. Sit under the elegant arches and enjoy a great view of the main courtyard. Jardin de Palais Royal - you'll feel like you just discovered a secret garden and in fact you'll almost be right as this is a beautiful part of Paris that is often overlooked by tourists. 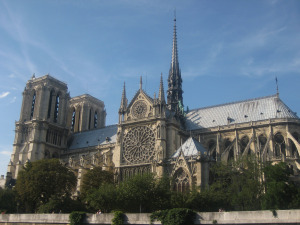 Built between 1160 - 1345 Notre Dame Cathedral is a must see. The detailed craftsmanship is incredible from the front doors to the famous gargoyles to the amazing stained glass windows and the flying buttresses. There is no way you can be disappointed by Notre Dame Cathedral. Isle St. Louis - the small island behind Notre Dame is well worth a visit. Stroll the cobble streets, browse the little stores and don't forget to try the famous "Berthillion" ice cream which is made on the island but famous all over Paris (considered by some the best ice cream in the world). On Sundays a Jazz band plays on the bridge behind Notre Dame leading to Isle St. Louis. Michel Fountain in the middle of Place St. Michel shows St. Michel killing a dragon and is one of the most popular meeting points in Paris. Latin Quarter - stroll down rue de la Huchette and rue de la Harpe known for their lively atmosphere and little bistros. The Greek sandwiches "sandwich grec" are great here but it's hard to find good restaurants as they are mostly very touristy and a very poor standard. Saint Chapelle - Gothic chapel on the Île de la Cité famous for it's stained glass windows. If you're looking for a family friendly restaurant and feel like a break from French food try Pizza Marzano on Place St. Michel. The pasta and pizza are great and very affordable. If possible get a table upstairs and enjoy the amazing view of Notre Dame. Paris landmark that may be filled with tourists, but it's still worth the trip. 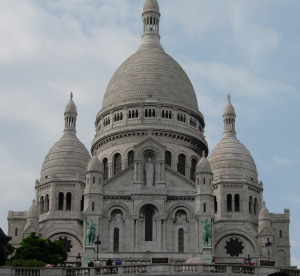 The Sacre Coeur is a Romano-Byzantine church started in the 1870s and completed in 1914. The dome of the Sacre Coeur is the second highest point in Paris, after the Eiffel Tower. When you sit on the steps of the Sacre Coeur and you will literally have Paris at your footsteps - the view is exceptional. 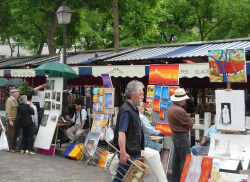 After leaving the Sacre Coeur stroll back to "Place du Tertre" the picturesque square where artists still paint pictures, mostly just portraits of tourists but still not a bad souvenir to bring home from Paris. Cafes and restaurants are very touristy but kids will enjoy the big ice creams served at some of the cafes on the square. Moulin de la Galette - the windmill that inspired paintings by Vincent Van Gogh and Auguste Renoir. Moulin de la Galette has been renovated and turned into a restaurant. Address: junction of rue Tholoze and rue Lepic. The crazy, controversial, colorful building with the "guts" on the outside. 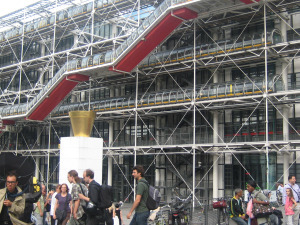 The Pompidou Center houses Paris's museum of modern art, along with extensive art library and an industrial design center. 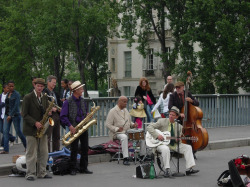 Come on a Saturday and enjoy some of Paris' best street entertainers performing for free in the plaza in front of the building. Another favorite spot for my family in Paris is the colorful Stravinsky Fountains. Grab a drink, coffee or a light lunch at one the fun cafes next to the fountains and just relax and enjoy this very different part of Paris. Hotel de Ville - Highly ornate and elaborate town hall. If you are here in December or January enjoy the free ice-skating and the two story carrousel on the square in front of the town hall. St. Eustice - one of the most beautiful churches in Paris. Its interior plan is modeled on Notre Dame. 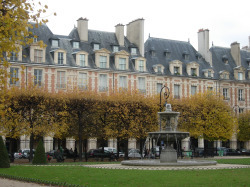 Place des Vosges is oldest and in my humble opinion the most beautiful old square in Paris. Once a site of jousting and tournaments, the historic Place des Vosges is a square of perfect symmetry. 36 houses, nine on each side, of brick and stone, which are still intact after 400 years. Stroll the small park, sit at one of the cafes under the arches or browse the small art galleries. Visit the Victor Hugo House and museum at number #6 Place des Vosges or try to find the door that leads you to the hidden gardens of the Hotel de Sully. When you are ready to move on take "rue des Francs Bourgeois" to the "Musee Carnavalet". This museum was created out of two old mansions and is now a museum of French history. The museum is free and is definitely worth a stop. Although most of the descriptions are in French the building itself, the collections and the small tranquil gardens are well worth a quick stop. Next make a left on rue Pauvee, stick you head into the courtyard of the Paris History Library for a quick pictures and then continue down to rue des Rosiers. Now you are in the heart of Paris's old Jewish quarter. Stroll the cobbled streets of rue des Rosiers, rue des Ecoffes, rue Vieille-du-Temple and rue du Roi-de-Sicile. Enjoy the mixture of designer stores and old Jewish bakeries and delis. For lunch try the neighborhood specialty "falafel sandwich" at the famous l'As de Falafel # 34 rue des Rosiers. A magical oasis of greenery in the heart of the Latin Quarter. 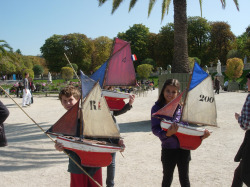 The Luxembourg gardens are popular with students and families who bring the children here to sail boats, ride ponies, watch puppet shows, or play in the special fenced playground area. 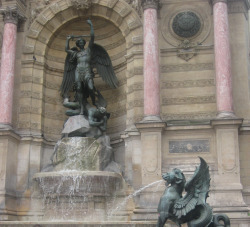 Medicci Fountain - Another one of my favorite spots in Paris. Orchard - Espaliered fruit trees and bee hives in the southern end of the park. Bustling neighborhood of St. German-Des-Pres packed with great shopping, restaurants and cafes - visit our restaurant guide for a few of our favorites. 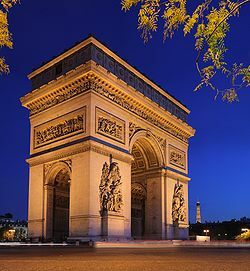 The Arc de Triomphe is one of the most famous monuments in Paris and even though it's not one of my favorite places in the city it should still be on your "must see" list . Twelve avenues radiate from the arch which explains why it is also called "place de l'Etoile" (etoile meaning star). Watching the traffic navigate this roundabout is half the fun of a trip here. Napoleon commissioned the arch in 1806 but it was not finished until 1836, under Louis Philippe. 1840 - Napoleon's body passed beneath the arch on its way to its final resting place in Les Invalides. 14 July 1919 - Victorious allied armies marched through the arch and down the Champs Elysees. 26 August 1944 - Paris was liberated from German occupation and Charles De Gaulle marched through the arch. One of the best views in Paris is from the top of the Arc de Triomphe so if the lines are not too long make the time to make the climb - you won't regret it. Champs-Elysees - Again not one of my favorite parts of the city. I find it crowded and very tacky. Today the Champs Elysees is lined with restaurants and cafes, car showrooms, cinemas showing original language movies, nightclubs and luxury fashion boutiques. Grand Palais - Built for the Universal Exhibition in 1900, this is one of my favorite buildings in Paris. with its classic stone facade, Art Nouveau ironwork and an amazing glass roof. Check our art exhibitions in Paris section to see if any exhibits are being shown there right now. Petit Palais - Built at the same time as the Grand Palais this beautiful building now houses the City of Paris Museum of Fine Arts collection. Entrance to the permanent collections is free to the pubic so be sure to check it out. There is a wonderful cafe in the pretty semi-circular courtyard and garden. Hotel Les Invalides - Built in 1671 by Louis XIV for his wounded and homeless veterans, Hotel Les Invalides still houses a veteran's hospital, a war museum and under the gold dome you will find the tomb of Napoleon Bonaparte. Entrance to the main courtyard is free and definitely worth the walk. Stop in and see St. Louis Cathedral and then you can decide if you wish to purchase tickets for Napoleon's tomb or the war museums. Rodin Sculpture Museum - Another one of my favorite places in Paris. All Rodin's key works including "The Thinker" are on display in this wonderful old house museum and garden. If you don't have time to do the whole museum just pay the small fee to visit the gardens where you can sit, relax and feast your eyes on amazing works of art - click here for a list of current art exhibitions in Paris. You can bring in a picnic or take advantage of the small garden cafe. Address: 77 Rue de Varenne.